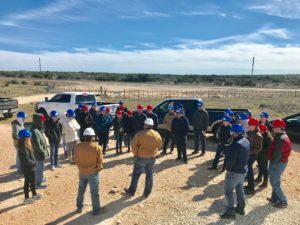 McCombs cleantech MBA students visited the Sweetwater wind farm in Nolan County, about 4 hours northwest of Austin. Rod Wetsel, a lawyer who negotiates land deals and PPAs in the area, led the tour along with Ken Becker of Sweetwater Economic Development. Students also met with wind technicians from GE and Leeward Renewable Energy as well as landowners who lease for the wind operations and can still run their ranches. McCombs students were joined by law students from the University of Texas at Austin and Texas Tech University. The 585 MW site is among the top ten largest in the United States. Portions of the site were recently repowered. 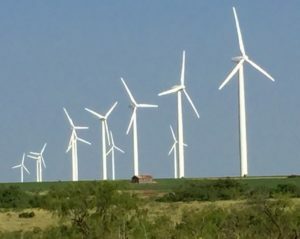 Texas leads the nation by far in wind energy production, with $42 billion invested capital, 23 GW installed capacity, and supporting more than 24,000 wind-related jobs, according to AWEA, a wind energy industry group. The next closest state is Oklahoma with about 7.6 GW. “It was great having the chance to speak with an O&M crew and see how they monitor the projects on a daily basis but also hear directly from landowners about their experiences working with developers to get a better understanding of the various stakeholders involved,” said Topher Lancaster, MBA class of 2020. For more information on the cleantech MBA concentration at the McCombs School of Business, visit https://www.mccombs.utexas.edu/MBA or http://cleantechaustin.com/mba-cleantech-concentration/. To recruit Texas MBAs for projects, internships or full time roles, contact cleantechgroup@mccombs.utexas.edu or faculty advisor John C. Butler, PhD. CleanTech Group is a student-run organization at McCombs School of Business at University of Texas at Austin.